Fill the days between Christmas and New Year with Flamenco! Study Choreography, Sevillanas, Technique, Bulerías, Castanets & Rhythm with top teachers in this popular course. This year we are delighted to bring Mercedes Ruiz to teach the Intermediate and Advanced Choreography and Bulerías Level 2/3. The Flamenco dance course includes classes at four levels: Beginners, Elementary, Intermediate and Advanced. 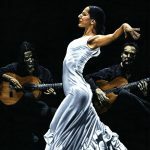 All students will study flamenco dance technique as well as choreography. The Beginners and Elementary will be taught by Victoria Ramos and Intermediate and Advanced by Mercedes Ruiz. The class is one and a half hours each day. 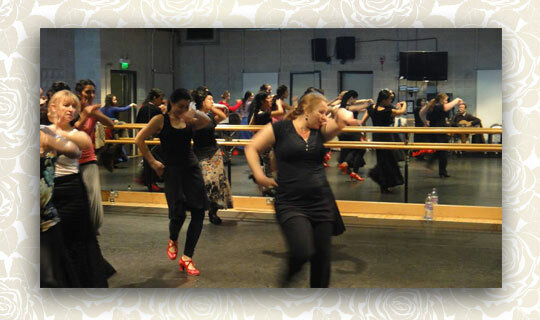 The beginners’ class is a great opportunity to learn the popular feria dance, Sevillanas. The class is taught by Victoria Ramos for one hour each day. This course teaches the famous flamenco dance of Jerez — the Bulerías. These short pieces of choreography, full of character, are traditionally featured at the end of flamenco shows. This course is taught at two levels: Level 1 is taught by Victoria Ramos and Level 2/3 by Mercedes Ruiz. The class is one hour each day. In this class you will improve your style by working on arms, footwork and turns. This class is taught at 2 levels: Level 1 and Level 2 are taught by Victoria Ramos. This class is an hour a day. This class is taught by Victoria Ramos for one hour each day. A great course to learn Palmas & structure of each rhythm. Some songs will be added during the course for understanding & knowledge. This course is suitable for dancers, guitarists & singers and is taught by Jasmine Villalobos & Tito Heredia for one hour each day. Mercedes Ruiz García was born in Jerez de la Frontera in 1980 and began her studies at Ana M López Lara’s academy at the Peña los Cernícalos venue when she was only six years old. In 1993 she studied Spanish classical dance with Raquel Romero and a year later she entered the Conservatory of Dance of Seville. Mercedes continued to improve her dance in the academy of the Chiqui de Jerez and in the Cibayi, where she went to the courses of Antonio Canales, Yerbabuena, Javier Latorre, Adrián Galia, Mario Maya, Alejandro Granados and Domingo Ortega. Two years ago she won the Antonio Gades Prize at the 16th National Competition of Córodoba for her interpretation of the Zapata, an award that came to reward a long career and despite her young age, she has performed in tablaos, theatres and festivals all over world. Mercedes is currently working with Eva la Yerbabuena and Andrés Marín. Victoria Ramos: Head of Centro de Baile Jerez; has performed and taught workshops all over the world. She began her first steps of flamenco at the age of six. She is a Spanish flamenco dancer and a Spanish classical by the “Sociedad Internacional de Baile Español” and is currently an examiner of the Spanish Society. She has worked professionally with several companies including the “Paco Peña Company” and the Guillermo de Perete Company with whom she traveled worldwide. 25 years ago she settled permanently in Jerez de la Frontera where she runs the prestigious school “Centro de Baile Jerez”. Over the last few years she is dedicated to teaching and choreography teaching classes and courses worldwide. Some choreography work has been for Onda Jerez TV at the Villamarta Theater, London Weekend TV and the Jerez Fair. Her students have danced on several occasions in Jerez, participated in tours in Europe and in the Flamenco Festival of Sadler Wells London. Jasmine Villalobos & Tito Heredia: Professional Singer & Guitarist from Spain. Nearest Tube: Angel on the Bank branch of the Northern Line. By Bus: Numbers 19, 38 and 341 travel from the West End to the theatre’s own bus stop. Many buses travel from Waterloo, Liverpool Street, Euston and Kings Cross stations to the Angel. Please return your form with course fees to Escuela de Baile, 35 Tintagel Drive, Stanmore, Middlesex HA7 4SR. Please make cheques payable to Escuela de Baile. The course is extremely popular and only prompt booking can ensure the course of your choice. Please phone if you are unsure of your level. The booking form is downloadable here Mercedes Ruiz Booking Form Christmas 2017. The full leaflet including the timetable will be available soon. For more information about Escuela de Baile please contact us.